I was reading the box and it gave a Chicken Parmesan recipe. I thought... I could make that. I thought I had all the ingredients, but I realized that I didn't have have any canned spaghetti sauce. My husband loves sauce, so Chicken Parmesan wouldn't be well received with no sauce. The results.. a dinner Justin deemed.. one of my BEST DINNERS EVER. Sorry for this long story, but this is how this random, easy, NON-GOURMET but incredibly delicious recipe came about. Lea would not be impressed especially after the dinner she cooked Meghan (the menu was something like chicken with tropical salsa, tropical salad with pineapple vinaigrette and pots de creme.. seriously Martha, oh sorry, I mean Lea). Trust me though, this fast, easy and somewhat ghetto recipe is delicious! It will take you less than 30 minutes to make and would be great for entertaining! 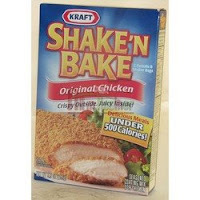 -Prepare Chicken according to Shake and Bake Directions, adding 1/2 cup of Parmesan Cheese to Seasoning. -In a saucepan, saute onion and garlic in olive oil over medium heat. Make sure it doesn't burn. Add tomatoes, Italian seasoning, sugar, red pepper flakes, salt and pepper. Bring to boil and continue to boil 5 minutes or until most of the liquid evaporates. Remove from heat; stir in whipping cream and butter. Reduce heat and simmer 5 more minutes. - When chicken is finished baking, remove from oven. Pour a tablespoon of Tomato Cream Sauce over each piece of chicken. 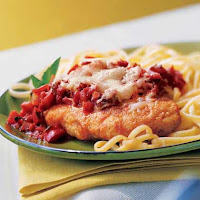 Top each piece of chicken with grated Parmesan cheese and shredded mozzarella. Bake another 5-10 minutes until cheese is melted. Serve over pasta. My mom told me that she loves your recipes... I'm still not sure how I feel about her reading my friend's blog... but the internet is public... not much I can do about that!